I ran across this idea for a mail organizer from Cotton Time. I forget which blog I was looking at that had a screen shot of the magazine page. Not having the measurements or directions, I winged it and am very pleased with the result. I first drew a scaled picture on graph paper and decided that the best size would be 18" x 20" for the background. Then I thought about what I wanted this organizer to do and drew in the pockets and determined what each pocket's size should be. When all was finished, the actual size is more like 18" x 21". 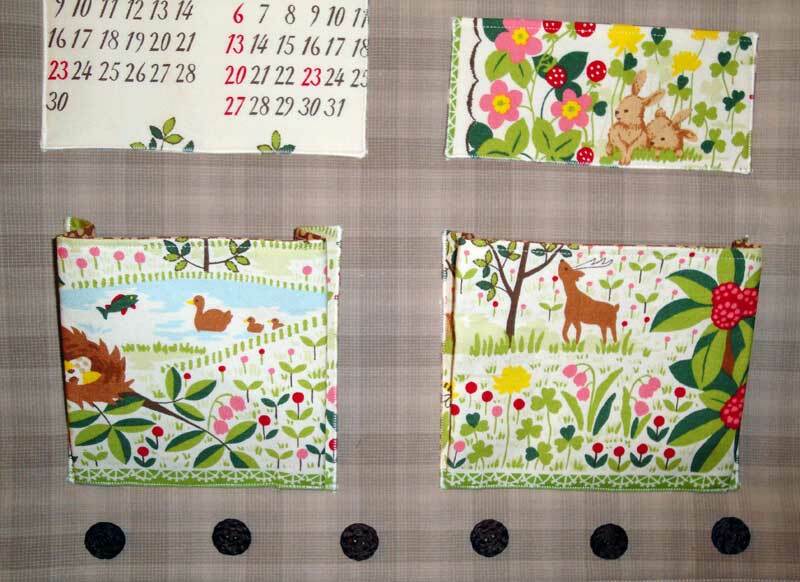 To make it, I used two fat quarters for the background and trimmed them to shape. I interfaced one fat quarter with decor bond and the other with fusible batting for some rigidity and shape. 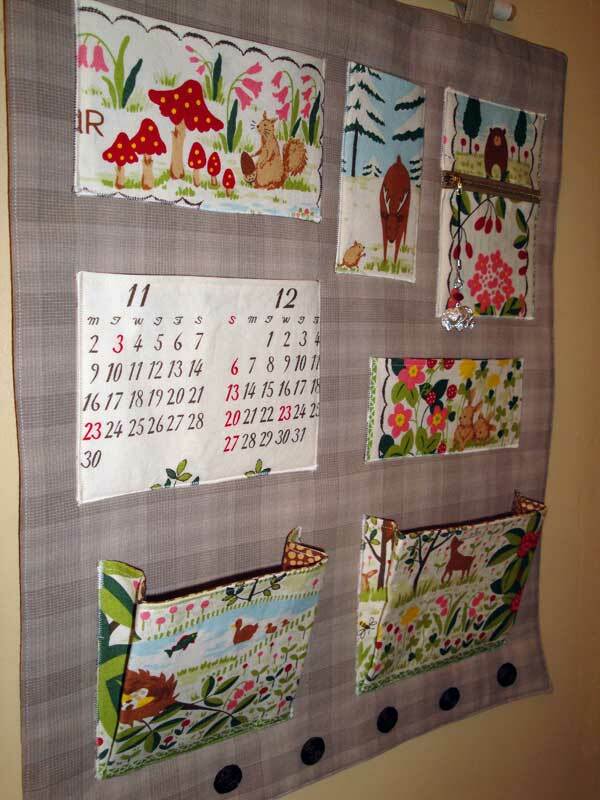 The fabric for the pockets comes from a repurposed 2009 fabric calendar from Japan. Each pocket was interfaced with decor bond. The pockets were then secured to the background with a zig zag stitch. At the bottom are six buttons to hold hanging type things. 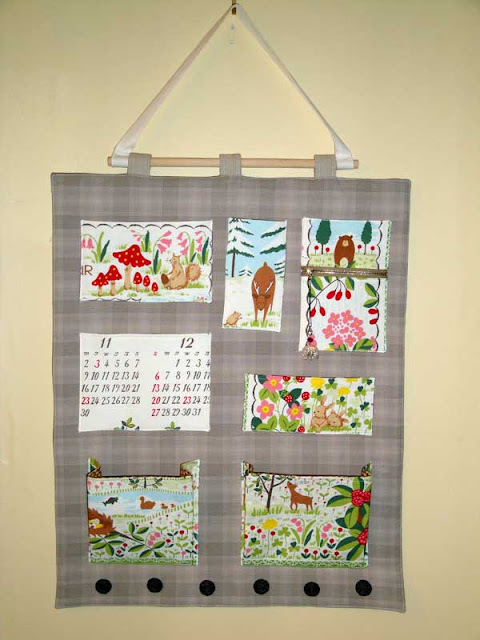 Overall I'm very happy with the end result, although I'm slightly annoyed that the deer pocket is crooked. I have no idea what the zipper bear pocket would hold, but it's a nifty little touch. The zipper pull is an elephant charm. The dark circles look more like buttons that they are in the picture below. This took a few hours to make... maybe 4-5 hours from start to finish, but my entry way looks so much better now. Were I to make this again, I probably would reinforce the the background mat just a tad more. It's fairly strong and keeps its shape reasonably well, but it does bend a little when there are a lot of things in the two bottom pockets. It's not a deal breaker though. The little crocheted bags hanging from the buttons were made by my mom. 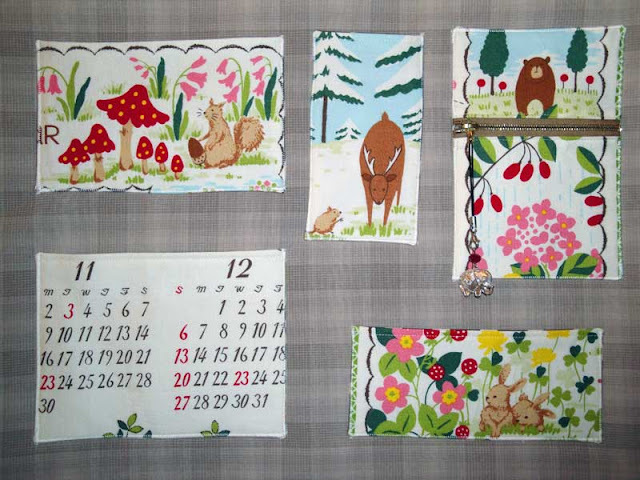 Each bag takes about one hour to make and the pattern is from a Japanese craft book. They are all functional and would make great ornaments. Wonderful! 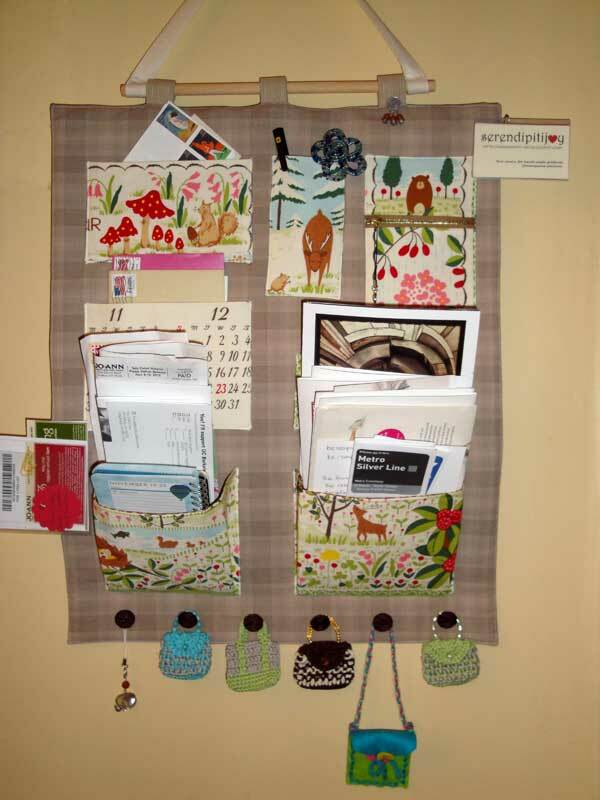 You could store your stamps and return labels in the zippered pocket.